Part of the fun of Meatless Monday is the quest to find a new recipe that is interesting enough to cook and photographic enough to share. This recipe was taken from Pushpesh-Pant’s India Cookbook, a large tome of over 1,000 Indian recipes. My criteria was pretty simple, an eggplant recipe that matched the ingredients I have on hand (eggplant, yoghurt, spices, a curry plant) and away I go. This recipe is super quick and really easy to make, not to mention delicious to boot, though admittedly not a pretty dish. 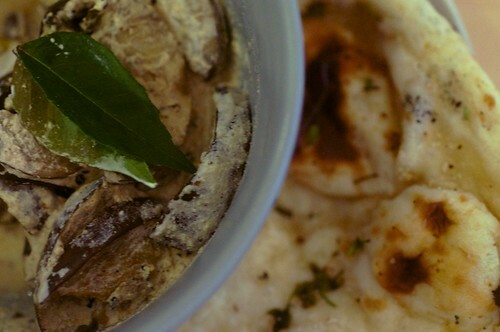 The yoghurt sauce is mild and nutty from the mustard seeds and is a lovely complement to the fried eggplant. Best served with roti or naan to soak the curry. I added a few additional instructions to the recipe for you to follow. My ongoing gripe with India Cookbook is that it is not the most intuitively written recipe book. Cut the eggplant into round slice. Put the chilli powder and turmeric in a bowl, season with pinch of salt and add 1 tablespoon of water. Pour the eggplant slices in the spice mixture bowl and mix the eggplant with the spice mixture. Coat a non-stick pan with a thin film of oil over medium head, add the ginger paste, garlic paste and green chillies and stir fry for about 1 minute. Add the eggplant and cook for 5 minutes until the eggplant is slightly brown on both sides and set aside. In another pan, place the yoghurt with half a tablespoon of water, then bring almost to the boil, stirring constantly to ensure that it does not curdle. Heat the remaining oil in a heavy-based frying pan over medium head, add the asafoetida and mustard seeds and stir-fry for 1 minute, or until the seeds start to splutter. Add the dried red chillies and stir-fry for about 2 minutes, or until they turn a shade darker, then add the curry leaves. Pour the tempering over the yoghurt mixture. Return the eggplant to the frying pan, pour the yoghurt over the fried eggplant and mix with a wooden spoon. Simmer for a few minutes until the yoghurt and eggplant are hot. Sounds delish. Can never have enough eggplant! Thanks and yes to eggplant! One of my favourite veg by far. The nice thing about this one is it’s pretty quick to make.